Holiday Sewing 3: Finished the Quilt! Whew! Xmas is over and we all lived to tell the tale! I had my doubts. After all, I committed to making all my presents, THEN decided to host my mother and sister for Xmas dinner while planning an overambitious menu. But I just kept reminding myself of what I’ve pulled off in the past: the year that my partner called a few days before to tell me he’d picked up four additional “strays” for Xmas dinner, the year that I had two glasses of mulled wine on an empty stomach and cooked a beautiful dinner while sloshed . . . . But I pulled it off. A lovely dinner and all the presents got finished. So three line drawings of bicycles to trace, four to embroider, the quilt top to assemble, and quilting and binding to be done. Luckily, my honey was out of town for most of the weekend, so I sat down and did nothing but embroider and sew all weekend. The embroidery designs were from here, though it looks like the set no longer includes the penny farthing. I enlarged them a bit on a copier, then taped each to a window and traced it to the muslin with a mechanical pencil. I embroidered them mostly in backstitch with a single strand of floss, but used a 2-strand lazy daisy stitch for the tires. The base fabric was muslin, and I backed all four pieces with Sulky Soft ‘n’ Sheer stabilizer; instead of cutting it away at the end, I left the stabilizer intact, as the muslin was fairly sheer. The quilt pattern I used was this one, though I reduced the number of blocks so that my quilt would be a good size for hanging on the wall (about 27″ square). I had forgotten how long it takes to hand sew a quilt binding, but I finally got the quilt finished on the evening of Xmas eve and had enough time to quickly sew up my mother’s “scoodie” before I went to bed that night (no pictures of the scoodie, unfortunately). Even with the time pressure, this embroidery was so fun to do! And my partner loved his new quilt–he’s already got a spot on his office wall where he wants it to go. My sister was very happy with her new bag, too! And I’m now on to new projects, of course. More on that soon. Sewing of presents continues! I finished these ornaments last week for my partner’s sister and her husband. The inspiration came from this post that I had bookmarked some time ago. Boy were these fun to make! Messy, though–since I didn’t have a plan in mind before I started, I pulled out all my wool felt, beads, buttons, and embroidery floss. I chose my felt colors, cut out the hearts, then selected beads and floss. I really liked the way the ornaments in the original post were done in duller colors with a few bright accents, so that’s what I tried to do with mine. The embroidery is simple straight stitching and lazy daisy, so fun and relaxing to stitch. No measuring, nothing fussy, just me holding the ornament at arm’s length and thinking about what might look interesting where. These will be packed up this weekend with some bags of spices and a recipe for mulled wine, our version of the Cook’s Illustrated method. The package has to get all the way to Provence, so it won’t make it by Xmas, but I’m sure it will be appreciated whenever it does arrive. Strain wine through fine-mesh strainer; return wine to saucepan and discard spices and orange zest. (Cook’s Illustrated recommends adding the brandy and more sugar to taste at this point; I’ve never found that to be necessary.) Ladle wine into small mugs; serve immediately. Please note that this keeps well in the fridge and leftovers are lovely microwaved on a chilly evening. I’m not a wine drinker–I’m barely any sort of drinker at all–but I love this stuff. I’m now into my next holiday project, a wall quilt for my partner that I have literally been trying to finish FOR YEARS. This time I’m going to do it! And the first block has been embroidered and pieced. Plenty to do yet–I’d better get back to it! So . . . I’m not sure what came over me, but I’ve suddenly taken on all these Xmas sewing projects. I usually avoid sewing with a deadline, as it really stresses me out, but I just somehow felt the need this year. I’ve probably got too much planned, so I decided to just get the first one done and then reevaluate if I could realistically do the others. Here’s the first one, a tote bag for my sister, who is not a small-bag person, if you get what I mean. Shelby was intent on getting into every picture I took this morning. The pattern was a freebie that I found here and I recommend it; I always give a big ol’ side eye to free patterns, but this one was well-written and clear. The only changes I made were to skip quilting the body of the bag and to add the loop closure at the top. Everything used here was from my stash, and this is why I keep such a big collection of fabric scraps, buttons, beads, and findings. I can look at a half-finished project, decided that it needs a closure that looks more or less like THIS, and then find what I need in my own sewing room to make that happen. The body of the bag is a lovely thick, plush corduroy. (I realized somewhere in the middle of the sewing process that black corduroy is perhaps not the best choice of fabric for someone with way too many furry pets, but it’s wonderful fabric nonetheless.) 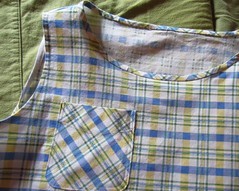 The front pocket is a Laurel Burch print. A note about the closure: I can’t remember where I got the idea to stack up beads and buttons to make bag closures (it was years ago now), but it makes for a visually-interesting detail and is also fun to do. You can see in this picture that I’ve got a smaller bead on the bottom as a sort of spacer that makes a niche for the loop to fit into. Above that is an opalescent glass doughnut, a black button, and an interesting blue bead. Sometimes you can stack them up, then run a needle and thread through the whole mess several times and be done with it. In this case, the bottom bead wanted to slip through the hole in the doughnut, so I sewed that on first, then the doughnut and button together on top, and finally the blue bead on top of that. So, first holiday present down, and I’m off to Joann’s this afternoon to pick up supplies for the next. Happy Monday, everybody. I hope a good weekend was had by all and that those who celebrate Thanksgiving had a fun, low-stress day. My partner and I had our Thanksgiving meal at a local hotel buffet, as we’ve done for the past few years, and this time we were joined by my mother and sister. Nice food and conversation and all the beef and gravy that my carnivorous roomie could eat. He and I took a walk along the Columbia River afterward, then headed home for mulled wine and a nap. Not a bad day. On Saturday morning, we headed south toward Portland. The plan was to meet up with some cycling friends in the afternoon, partner and friends would go off for an evening bike ride, then we’d all get back together for brunch on Sunday morning. Our van had a different plan for the weekend. We made it about halfway, then turned around and came home, as we weren’t sure the van would survive the whole trip. Major bummer, but at least it meant that we didn’t have to share the scones I had made for the brunch. Those are cheddar and chive on the right, cranberry on the left. I used half all-purpose unbleached flour and half white whole wheat flour to make them, and I added the zest of an orange to the cranberry ones, but other than that I stuck to the recipes. The dough for the sweet scones was awfully soft, and I didn’t add the extra flour suggested in the recipe, so they spread out a little in the oven. Both scone versions were great, though, and we really enjoyed them with our own little Sunday brunch at home. I actually had to break down and purchase fabric for this, which offended my cheapskate and stash-busting sensibilities NO END, but the fabric was on sale at Joann’s and I had a coupon, so that’s okay, I guess? That’s my story, anyway. I also took a break from that project last week to whip up a long-sleeved tee-shirt using Butterick 5948 and the red knit fabric I got through Freecycle. Here it is with a jacket I picked up several years ago from a Coldwater Creek outlet store (still grieving the loss of that store–sigh). After all the complicated projects I’ve been working on lately, I was dying to make something that was actually QUICK AND EASY. You know, something that I actually had enough fabric for. So that’s what this was. I cut it too big, but it was easily trimmed down later. 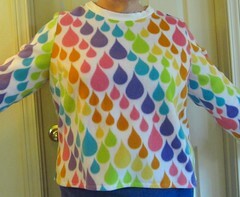 I kept it big enough and long enough that I can either wear it as a tunic or tucked into bottoms for layering. 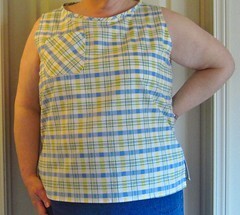 The neckline is a bit wonky–one of these days I need to buckle down and actually learn some things about sewing knits–but it’s soft and cuddly, and it was actually quick and easy, so I’m happy with it.